Thank you for viewing our articles. If you have found this page you are likely looking for licensed contractors. We recommend you take some time to read what we have to share. Our company works hard to remain informed of industry changes that impact your property, and we are licensed contractors. It is our goal to help you understand what your home improvement project entails, and clearly communicate what needs to happen on your particular job. Please do not hesitate to contact us should you have any questions at all. 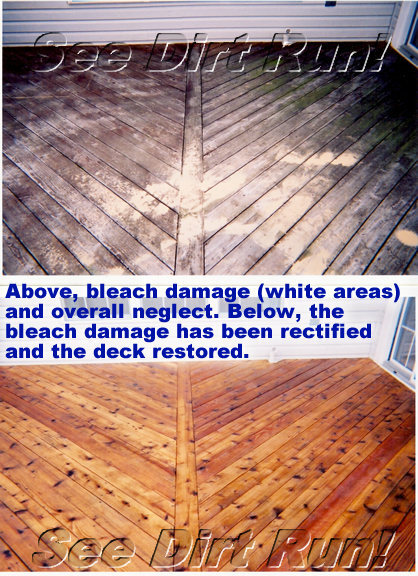 We look forward to assisting you with your wood care needs for many years to come. Vice President, See Dirt Run!™ Inc.
Have they contributed to the industry they are a part of through volunteerism? See Dirt Run! Inc. has. Have they published any articles in any trade journals or magazines? See Dirt Run! Inc. has. Have they done any public speaking at industry events? See Dirt Run! Inc. has. Are they considered leaders in the industry they serve? See Dirt Run! Inc. is. Have they mentored other companies? See Dirt Run! Inc. has. Did you get a real office or an answering service when you called the number? We do not use an answering service. When you call our office you’ll get a See Dirt Run! employee. Do they use sub-contractors or employees? See Dirt Run! Inc. only uses employees. No sub-contractors are used. Each employee is trained by our President to his exacting standards. Was the presentation they gave you professional? Were all of your questions answered fully?